Barriers for peace, or barriers to peace? 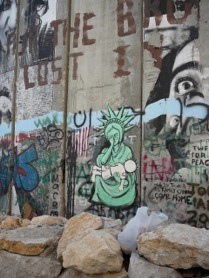 In this sociopolitical essay, Dr. Christine Leuenberger of Cornell University examines the effects of border walls over time, with a poignant comparison of the previously unsurmountable Berlin Wall with today’s West Bank Barrier. He only says, ‘Good fences make good neighbors’”. With the fall of the Berlin Wall in 1989, a new era of open geographical spaces and unparalleled mobility seemed to replace a world divided along ideological and political lines. Globalisation, ostensibly, brought about the demise of nations. With the development of a worldwide information superhighway, physical borders seemed to become obsolete. Since 1989, however, walls and fences have again been built across the globe, dividing people, cultures, and territories. Indeed, one of the results of global interconnectedness is a proliferation of borders, checkpoints, and physical and virtual frontiers. How can we explain the rise of such new strategies of exclusion? The post-1989 emergence of global capitalism produced unprecedented wealth, unmatched economic opportunities, and stark inequities. States faced new sets of problems – waves of immigrants, illegal activities along borders, and rising ethnic violence. Politicians, policymakers, and security forces, seeking to curb such social problems, reverted to the historically widespread strategy of constructing Strategic Defence Systems such as barriers, walls, and fences. Such technologies of division can allegedly create security, curb terrorism, minimise ethnic violence, and inhibit illegal immigration, smuggling, and drug trafficking. The post-1989 hopes for freedom and mobility have therefore gone hand-in-hand with a new age of walls. The partition of the West Bank – through the establishment of barriers, no-go areas, and an Israeli road system to which Palestinians have limited access –channels Palestinians and Israelis into separate but often parallel geographical spaces. Israeli law prohibits Israeli citizens from entering Palestinian-controlled areas, and stipulates that Palestinians need special permits to enter Israel or to cross Israeli-controlled areas within the West Bank. These closure mechanisms and policies provide for only a few spaces in which Israelis and Palestinians may still meet. They mainly include potential friction points such as checkpoints. By 2011, over 522 closure mechanisms existed in the West Bank, including roadblocks, fixed and temporary checkpoints, barrier gates, and crossing terminals into Israel. Many Palestinians must pass through them daily to reach schools, work, and medical facilities. These crossing points are some of the few spaces where Palestinians and Israelis may still meet one another. They have become the public stage of the conflict. They are sites for potential confrontations and violence; they “serve to… increase the space, physically and conceptually, between neighbors” [iii]; and they embody the power imbalance between the sentries and Palestinian civilians. According to Liran Ron Furer, some Israeli soldiers also come to suffer from “checkpoint syndrome”. They sustain psychological damage by being in a position of power whilst feeling permanently under threat. Palestinian checkpoint crossers, on the other hand, complain of humiliation, random violence, and a culture of impunity amongst the soldiers. Conversations between Palestinians and Israelis, shielded from each other by bulletproof glass, are also unlikely to increase trust. Instead, technology built for protection helps reinforce the perception of each other as a threat to security and livelihood. The closure policies have also practically halted cross-border interaction. Some policymakers, including George J. Mitchell, have long recommended cross-community and trans-border cooperation as a step toward peace. Yet closures, barriers, and travel restrictions have weakened cross-border friendships and professional contacts. After the Wall was built, a Palestinian professor could only meet his Israeli colleague at checkpoints – the sole spaces where they could continue to discuss joint projects. Most people, however, don’t go through the trouble. Travel restrictions, permit refusals, and checkpoint delays mean that e-mail and Skype increasingly substitute for face-to-face meetings. For many Israeli and Palestinian academics, politicians, and peace activists, it is now easier to meet in Europe than in each other’s backyards. Spaces in which to discuss peace have become increasingly scarce amongst all the obstacles built to separate and protect the two peoples from one other. Barriers for Peace, or Barriers to Peace? Policymakers have erected political barriers since at least 1990 bc. Athens’s Long Walls, Hadrian’s Wall, and the Great Wall of China are amongst many built to resolve regional disputes. History teaches us that barriers may have a range of short-term advantages, yet in the long run they obstruct peaceful relations. Watchtowers, checkpoints, and fences don’t tend to reduce fear, social exclusion, and mutual suspicion, but to generate them; they often become sites of tension and violence themselves. Walls, after all, can become: “the malevolent face of the people who live on the other side” [iv]. At the same time, barriers reinforce the cultural gulf between people on either side. Stories about ‘them’ (on the other side) being different from ‘us’ (on this side) become ever more widespread. As people on the ‘other’ side recede into physical distance, they are more likely to become abstractions and stereotypes. When encountered at friction points such as checkpoints, these ‘others’ become visible only as part of a collective ‘otherness’: threatening, unfriendly, and dangerous. More than twenty years after the fall of the Berlin Wall, Germans continue to speak about the “wall in the head” that culturally and psychologically separates former East from West Germans. Twenty-eight years of separation, therefore, still have to be overcome. 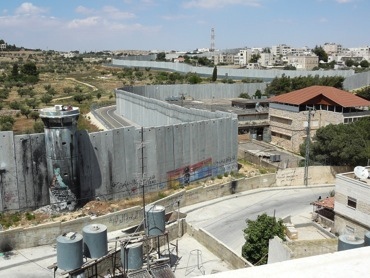 Whereas the Berlin Wall transformed into a nearly insurmountable ‘mental wall’ between East and West Germans, the West Bank Barrier, too, reinforces a psychological barrier that may long outlast its physical structures. Indeed, when the artists JR and Marco pasted images of Palestinians and Israelis onto both sides of the Wall, they hoped the people on each side would see themselves in the other. The images were quickly shredded and defaced. Germans climbed the previously insurmountable Berlin Wall on November 9th 1989 and toasted the beginning of a new era. The wall did not ‘fall’, but its climbers stripped it of its ability to divide. Today the Berlin Wall is a tourist attraction, and a line of cobblestones across Berlin mark where it once stood. The West Bank Barrier, too, may one day become an emblem of its time; its pieces of concrete and metal might remind us that walls like it have historically served to divide, and less to unite. They have never yet solved a conflict, but have always become an integral part of it. [i] Eyal Weizman, “The Geometry of Occupation”, Centre of Contemporary Culture of Barcelona (CCCB), 2004. www.urban.cccb.org. [ii] For more details see B’Tselem, http://www.btselem.org; UN OCHA, http://www.ochaopt.org; International Court of Justice http://www.icj-cij.org/docket/index.php?pr=71&p1=3&p2=1&case=131&p3=6. [iii] Eyad Hallaq, “An Epidemic of Violence”, Palestine–Israel Journal, 10/4. http://www.pij.org/index.php. [iv] Peter Shirlow, “‘Who Fears to Speak”, The Global Review of Ethnopolitics, 3/1, 2003: 81. [v] Ruchama Marton and Dalit Baum, “Transparent Wall, Opaque Gates”, in Michael Sorkin, ed., Against the Wall (New York: The New Press, 2005). Christine Leuenberger (PhD) is Senior Lecturer in the Department of Science & Technology Studies at Cornell University. She studied the social impact of the West Bank Barrier as a Fulbright Scholar, and is a current recipient of an NSF Scholar’s award to investigate mapping practices in Israel and Palestine. 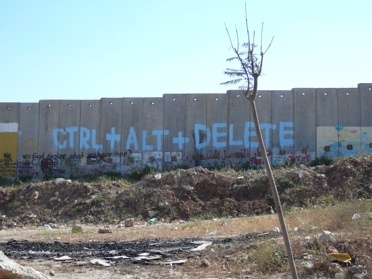 This entry was posted on 18/04/2014 by mondepasrondeditor in essay, graffiti, photography, visual art and tagged borders, Christine Leuenberger, Germany, Israel, migration, Palestine, walls.